Here it is, the fourth in my series (actually Ezekiel comes 3rd in the Bible) of Major Prophets of the Old Testament. 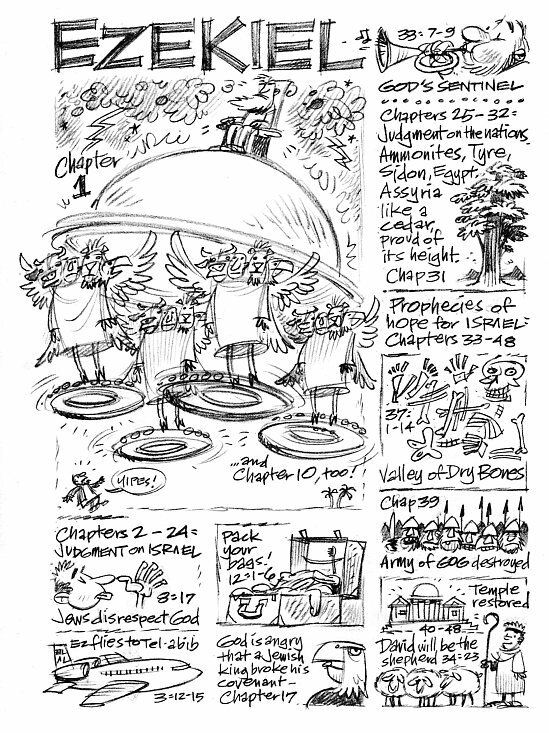 Boiling down Ezekiel to a one-page cartoon took longer than I’d expected. As with all the prophets, he uses lots of visual imagery to make his messages memorable. 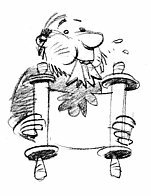 There was tons of material that I left out, as when God charges Ezekiel to prophesy by commanding him to eat a scroll. The Book of Ezekiel can be divided into three sections: God’s judgment of Israel, God’s judgment of Israel’s neighbor nations, and prophecies of better days ahead for Israel. The Chosen People have surely tried God’s patience—but before we gloat, let’s take a look at our own behavior! The words of Ezekiel and his pals aren’t merely for those long-ago times. Of course, the big show-stopping image is Ezekiel’s vision of the wheel. This was the most fun to draw and I hope I stuck pretty closely to the biblical description. It is definitely the weirdest image in the Bible. I was tempted at first to make it a UFO but decided that would be too cheap a gag. I gave the human form enthroned atop the whole contraption a touch of John Steuart Curry’s John Brown. A passage worth mentioning is Chapter 17, where the eagle plants a seed. It deals with God’s anger that a king of Israel broke his word to a Babylonian king—an enemy of Israel. How about that? Even though this Babylonian king is an enemy of God’s people, he must be dealt with honestly. The Jewish king’s covenant is an extension of God’s covenant. Each of us has a responsibility to behave with integrity no matter whom we deal with. The last image I drew promises that David will be set up as the shepherd over God’s sheep. It’s possibly another foretelling from the prophets of Jesus’ coming. The evangelist Matthew begins his gospel with Jesus’ family tree showing that He descended from King David. What did I forget? Oh, yeah—The Valley of Dry Bones! It’s the other big visual that Ezekiel is most remembered for. An entire valley of dried-up old bones brought back to life. How about some music? Here are the Delta Rhythm Boys singing Dem Bones. You want some more? Here are The Charioteers singing Ezekiel Saw The Wheel. Satan wears number 11 shoes. Yessir, I do love that old-time gospel music. Now you know everything you need to about the Major Prophets. With your fund of Major Prophet info, you certainly will be the life of every party. UPDATE—I’ve mentioned old-time gospel groups elsewhere on this blog. I should point out I first heard them and jazz groups from the same era on Rich Conaty’s radio show The Big Broadcast. Swing over and listen—and if you have a couple of extra samolians, drop something in the tip jar. Thanks!